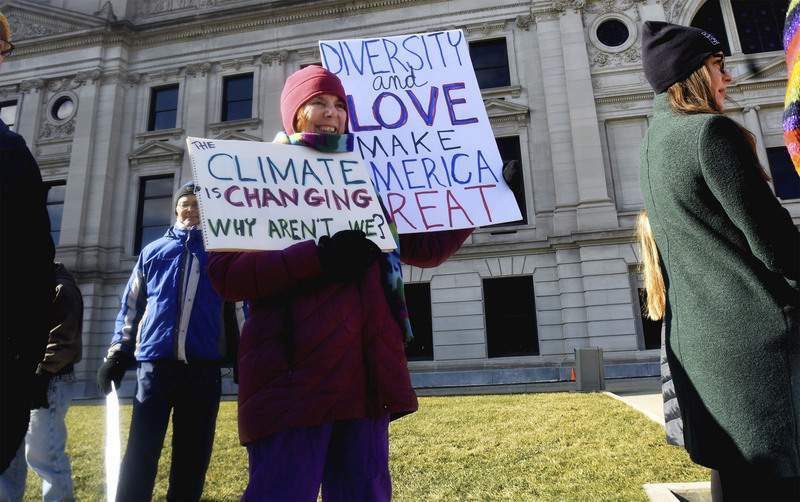 Photos by Katie Fyfe | The Journal Gazette About 75 people attended the third annual Women's March on Saturday, carrying signs and listening to speakers at the Allen County Courthouse Green before heading to the Allen County Public Library. Diane Dickson holds signs during Saturday’s rally. “We need diversity in this country,” she said. On the same day that Sen. Elizabeth Warren announced her candidacy for the Democratic presidential nomination, local women and men gathered downtown to show support for women. And immigrants. And blacks. And gays. And transgender women. And reproductive rights. And the environment. And gun control. “I think we're making a great deal of effort to be pointedly inclusive,” said Misti Meehan, chairwoman of the Allen County Democratic Party and the event's emcee. 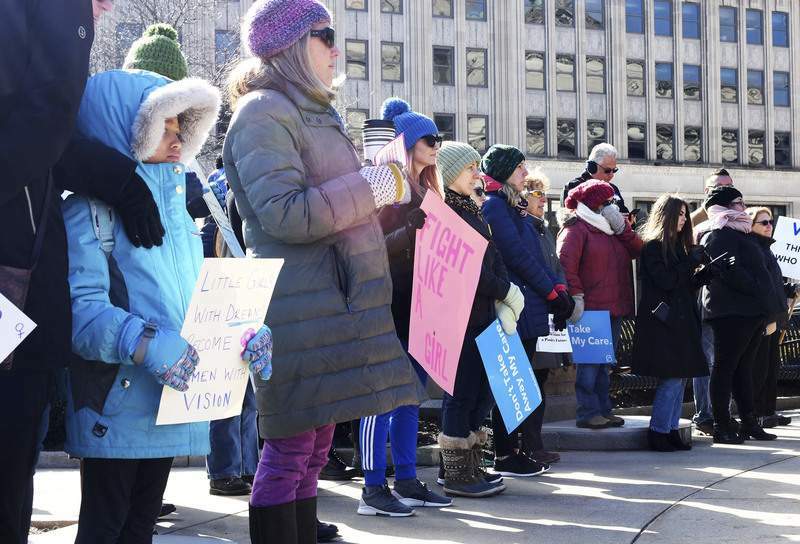 The third annual Women's March drew about 75 people to the Allen County Courthouse Square, where they listened to speakers Saturday before making a short march to the Allen County Public Library. Tables set up at the library allowed volunteers to distribute information about their nonprofit organizations. “I want people to know that it's important to understand why the policies and actions of the president are wrong,” the Fort Wayne woman said, adding that the Trump administration has rolled back environmental regulations created to protect water, land and air quality. Dickson explained that her sign referencing “love” was aimed at immigration policies. “We need diversity in this country,” she said. Jessica Bunch attended the rally to represent Planned Parenthood Advocates of Indiana and Kentucky. She's a local community organizer for the group. “Reproductive women's rights are our priority,” she said. Planned Parenthood closed its Fort Wayne office in July following constant pressure from pro-life advocates. The decision broke Bunch's heart. “It provided a lot of important health care to men and women in Allen County and the surrounding counties,” she said of the office that didn't provide abortions. Most of Saturday's crowd was female, between the ages of 20 and 60. But some men attended, and some little girls and older women also participated. Meehan kicked off the event by acknowledging the historic firsts among women elected to Congress in November. “We have got to change the legislation that sets all of us up to fail,” she told the crowd. Sharon Tucker gave a rousing speech, encouraging women to embrace their varied skin and eye colors. The Allen County councilwoman, D-1st, is a candidate for the Fort Wayne City Council. Galindo said residents could tap into the same spirit and determination to stand together and make a difference in the community. Shamanique Hall, who represented local Black Lives Matter advocates, said the movement is broader than it might appear. Réna Bradley, a community advocate, raised the issue of Fort Wayne's lack of access to affordable transportation and its relatively high infant mortality rate in the southeast section of the city. At least one of the speakers believed temperatures well below freezing played a role in the event's modest turnout. In 2017, when the gathering was the day after President Donald Trump's inauguration, an estimated 1,000 people crowded the courthouse square. Meehan, like others throughout the crowd, struggled to stay warm on the cloudy day with temperatures in the lower 20s. “It's cold out here. We're Hoosiers, but holy moly,” she said afterward, adding that attendance was probably also hurt because the event was originally supposed to be on an even colder day in January.